I got my first Spanish Lottery scam letter on Friday. It is from the ‘Spanish Sweepstake Lottery S.A’. 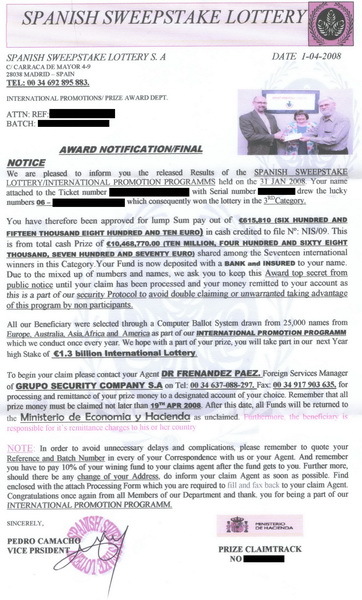 I knew it was a Spanish Lottery scam even before I opened the envelope. I’m including images of both letters and the envelopes. There are largable images for both the letters that you can see by clicking on the thumbnails. It is hard to understand how people can be fooled by these letters, but they clearly get a large enough response otherwise they wouldn’t be sending them. I did not enter the Spanish Lottery. You don’t win lotteries if you don’t enter. It is clearly a cheap ink jet printout rather than being on proper business headed paper. The letter does is not personally addressed to me. 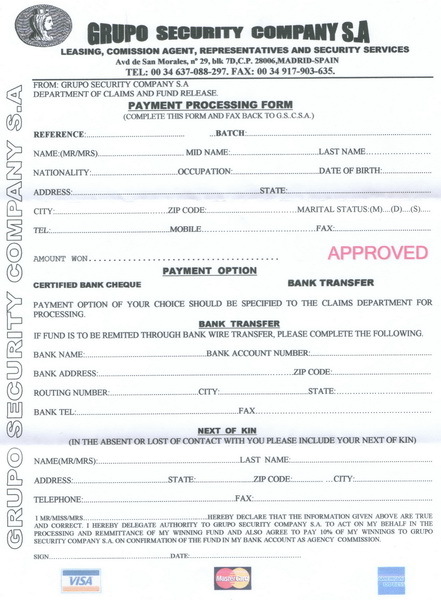 The deadline for claiming the money expires in a few weeks. The photo uses a British National Lottery image which is nothing to do with the Spanish Lottery. The number given is a Spanish mobile number. Spain’s dialling code is +34. The first number after this is a 6 which is a Spanish mobile number. The letter says that you need to pay a charge to claim the prize (what kind of crazy lottery makes you pay to claim your prize?). The English language on the letter is poorly translated. I’m sure the real elGordo Spanish Lottery could get a correct English translation. The letter says that the ‘win’ should be kept top secret. The scammers have however taken a bit of effort to make it seem more authentic. 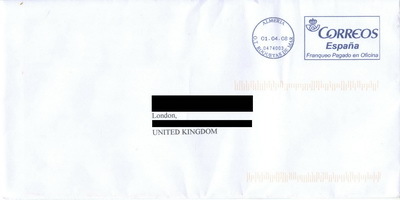 The letter was posted from within Spain and has a Spanish postmark. The letter is really signed rather than having a printed signature. I can even see an impression on the letter where ‘Pedro’ has signed another ‘winning’ letter. Pedro Camacho is a composer from Portugal by the way. This entry was posted on Tuesday, April 8th, 2008 at 1:52 pm and is filed under Money. You can follow any responses to this entry through the RSS 2.0 feed. You can leave a response, or trackback from your own site. I just got one too!! I have also received a letter i was glad i looked this up!! My dad received one at the weekend. I decided to do some back-ground checks on line. Will be promptly destroying it. I got one too. clearly didnt fall for it it also doesnt help they sent it to my mum and dads address and i havnt lived there for 2 years!! I recieved a letter this morning and was immediately suspicious. Later I searched on-line and found this site & info which confirmed what I thought. 09 Mar 09. I received one in mid-Feb. Various phone calls urging me to reply by deadline. As soon as they requested processing fee of £875 I smelt a rat. When I tried to speak fluent Spanish – he insisted in speaking in broken (but quite good) English. I offered to come to Madrid to hand over the £875 in person and to receive the cheque in exchange. He said that was not possible. Thank you for this web page – it confirms my suspicions. I faxed a copy (first page showing Pedro Camacho’s name and the initial ‘6’ telephone number highlighted) with a suitable comment in Spanish. This must be a first – my wife has won the spannish lottery and this after me winning it last year, almost to the day as well! Be warned they’re still out there and at it. My dad also recieved one. my Uncle got one too where the telephone number was not like the telephone number my dad recieved. And it’s true. You cannot win in a lottery if you don’t enter it. Thank you verymuch for this post ! I really Appreciate it and thanks again. Its fun to see that Mr. Pedro Camacho, being the “VICE PRSIDENT” of such good company, dont have enough money or brains to get a half decent word processor that points to the missing “E” in his title. But its not difficult to make a mistake about nationality, anyway… Most foreign people seem to not notice that Spain and Portugal are different and independent countries for more years that their own countries exist.